It took me most of my woodworking time for a weekend to get all the drawer fronts mounted on the drawer boxes. The process seems so easy. Drill a few holes for the hardware, drill some counter sunk holes in the boxes for attaching the drawer fronts, sink some screw and Bob's your uncle. Turns out there's a lot of holes each of which need some level of countersinking. But before getting into drilling holes I needed to put slick tape into the drawer openings. Slick tape is UHMW plastic with a sticky backing. It allows drawers to slide very smoothly. Unfortunately halfway though I ran out and had to order more. Even more unfortunately I couldn't find the same stuff I'd bought a few years back for my nightstand. All the stuff I was finding was much thicker. This is an issue because I'd sized the drawer boxes to just fit the openings assuming there was thinner tape. I ended up ordering a wide selection from Amazon until I found one I liked. After putting tape in all the openings I moved onto mounting the drawer fronts. First step for me was to mount the drawer fronts to the drawers. I drilled holes in the four corners of the drawer box fronts and countersunk them on the inside. 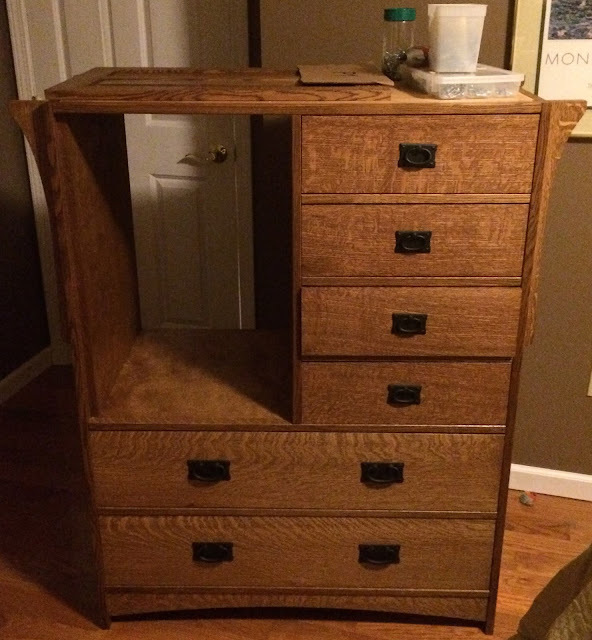 I then put the drawer in the dresser and centered the drawer front. I used double faced tape to stick the drawer front to the drawer box. 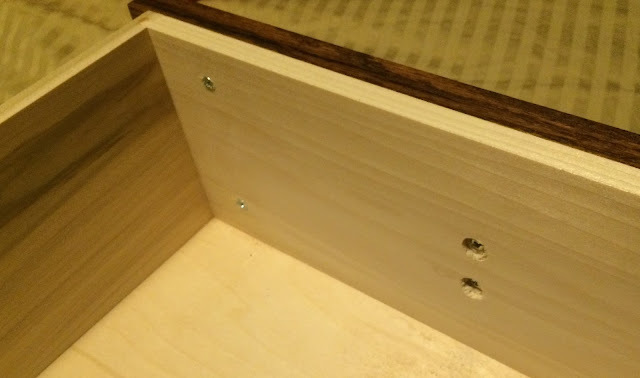 After getting the drawer fronts positioned correctly I used the holes in the box as a guide to predrill the screw holes for the front and then put in the screws holding the fronts to the boxes. I never have good luck with this technique. I almost always have problems with the fronts shifting after I've pulled them out. I don't remember if I had this issue with these drawers or not. I may have just used copious amounts of tape. What I've done in other cases is to use the holes drilled for the pulls and use a bolt and nut tightened from the front of the drawer to hold everything in position until I could get the screws in. So where are we at with number of holes drilled? Well, it's four per drawer; however, it required two different drill bits: one a little bigger than the screw for the clearance hole and one the size of the screw shank for the drawer front and a chamfer bit. Next is drilling the holes for the drawer hardware. This is another three step hole. The pulls have a stem that needs a countersunk hole in the drawer front, a smaller clearance hole through the drawer box and then another countersunk hole in the box so the machine screw heads are recessed. I made two different jigs, one for each drawer size, which helped me get consistent results placing the hardware. This last step required three more drill bits. Finally, I added some blocks in the back of the drawer openings to set the spacing. The blocks were supposed to be screwed in place but I was having problems getting the drill in to get the screws to go in straight. Instead I just grabbed my brad nailer and shot a couple of brads through each. That'll hold well enough and if I ever need to remove them they'll just pry right off. In any case, the job is done - well, mostly - and looks pretty good all things considered. That said, there are three issues already. At least two of the shelves the drawers ride on aren't flat. It wouldn't be a big deal if they bowed downwards but instead they are bowing upwards. This means there is a little "click" each time the drawer gets closed from the false front clipping the drawer dividers. 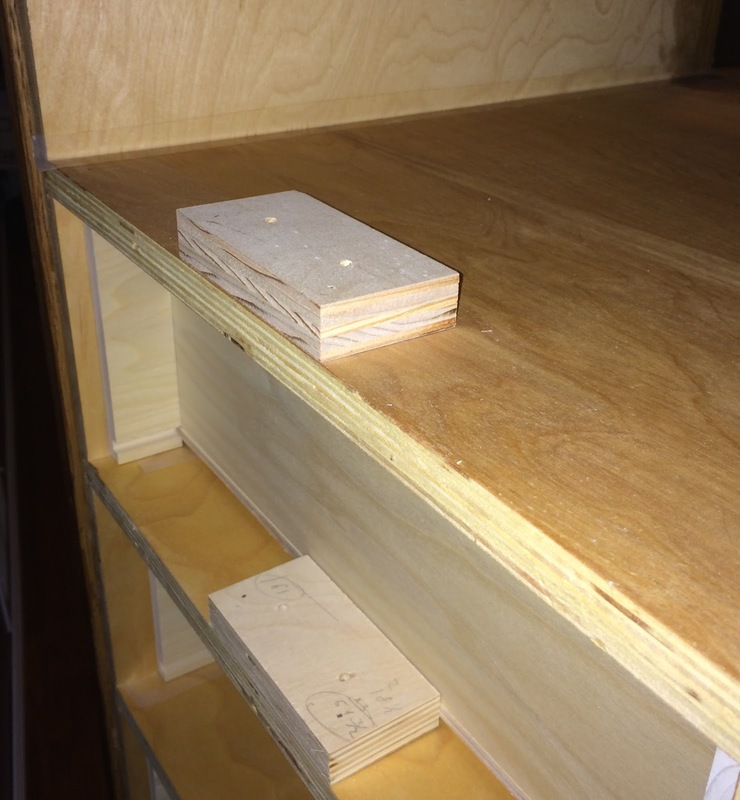 I mitigated some of the issue on one of the drawers by using a block place to shave the drawer box to not have a lip in the front; however, the false front still hits the divider. I still need to work on the other drawer. Unfortunately there isn't much more I can do about this issue. The only other serious issue is that I wanted my drawers to be tight and one of the small drawer openings is a wee bit smaller and none of the drawer boxes fit. To keep from having a sticky drawer I'm going to have to make the drawer a bit thinner either by planing the sides down or sanding them on my stationary belt sander. This issue is at least solvable. The last issue is that I'm not real excited about how well the false fronts fit the openings. I did a sloppy job cutting them to width and length and as a result when I look at them closely the gaps around them aren't consistent. This issue is merely a cosmetic issue that I will probably be the only person to notice.